Streamline your productivity with the best software-as-a-service (SaaS) applications in the business. Field Dailies delivers enterprise-grade security along with the availability and dependability you expect. 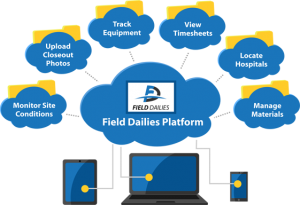 Field Dailies provides simple and powerful field crew management solutions that connects your office and field crews, giving you tighter control over productivity, cash flow, and employees in the field. More than ever, companies are under tremendous pressure to do more with less. Field Dailies cloud software solution is highly affordable for organizations at all levels, and the benefits go far beyond cost savings. Field Dailies designs and develops cloud applications that drastically reduce the high costs and inefficiencies of routing paper forms, collecting field reports, employee requests, and processing database-bound information. Quickly convert legacy systems into smart database-driven applications. Collaborate in real time using highly-secure interactive web and mobile applications. Cut overhead costs by automating business processes. Track detailed site conditions, including productivity, downtime, weather and other key events. Upload closeout pictures and create closeout reports instantly. Break down all daily work completed on the job. Quickly find the closest hospital in case of emergency. Field Dailies creates powerful yet economical field-service applications fine-tuned to the way you do business. 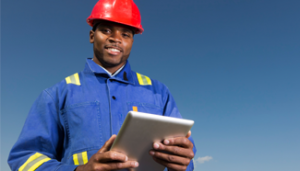 Our field data collection applications provides a reliable solution that yields immediate results. You can configure the solution to model your current process or integrate industry best practices to improve accuracy and delivery. Receive up-to-the-minute insight from the field, providing real-time information for decision-making support. Deploy the Field Dailies application on any Window device including PCs, Tablet PCs, Smart phones, laptops and desktop computers. $ 10 per user /mo. $ 30 per user /mo. Copyright © 2012-2019 Field Dailies All Rights Reserved.